Who do I send announcements too? Send birth announcements to any Family or Friends, Co Workers that you think would like to celebrate the arrival of your newborn baby. Make sure to include anyone who came to your baby shower. Our Birth Announcements allow you to write any sentiments on the back, you can also you this as thanks for your shower gifts if your in a time pinch. If you're working with a budget you could send printed announcements to just your immediate family and closest friends and then do an email announcement or a Facebook post to let everyone else know. We do sell additional announcements in lots of 45. When Do I send out announcements? Send out your announcements as soon as possible, if it takes you a little longer etiquette says you have up to six months to get them out. If you dont get out baby's right away everyone will understand that you've had your hands full with baby. If you do want to get your cards out sooner than later it helps to do a little prep while you’re pregnant. Whether you choose a printed announcement or digital, plan out your design before baby arrives. Once baby is here and you have his or her stats, get all that info to Renditure at your photo-reveal, I will be able to turn them around pretty quickly for you. Figure out what you would like to write, buy your stamps and get address's of recipients while your pregnant - this will speed things up so all you have to do once you get them from our photo lab, is write your notes & pop each one in the envelope and drop them at the post office. What to include.. An announcement usually has an introduction that includes baby's name (the intro can be as straight-forward or as sentimental as you choose), the birth details (baby's birth date, weight and length, plus time and place of birth, if you like), and the parents' names, followed by the names of baby's siblings (you can include fur siblings too if you have pets). Less is more in these scenarios, if you make it to busy the focus is taken from baby. Renditure will help you will all custom designing needs so you have the perfect announcement for your little one. 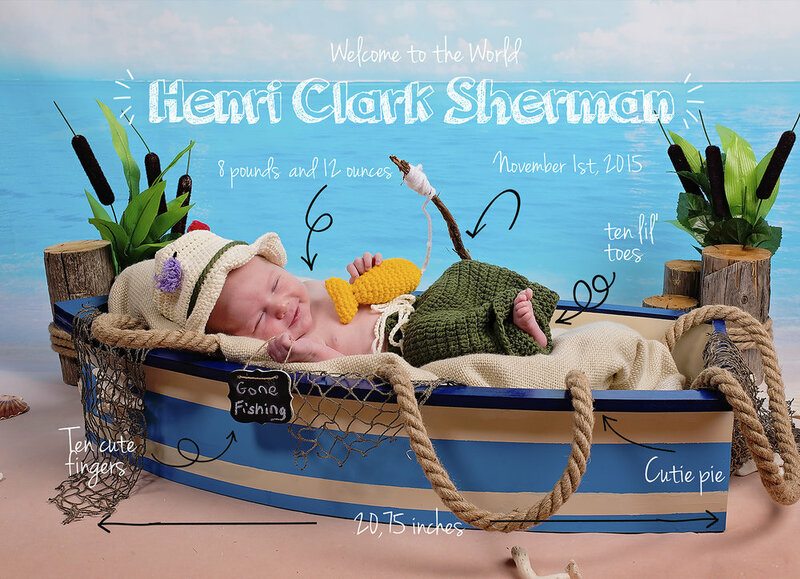 Birth Announcements are included with all our Newborn Sessions. They are a timeless treasure you and all your family and friends can enjoy to announce the birth of your new baby. Here are some our of our recent and old babies. Who Should I send a Birth Announcement to? You should send an announcement to everyone who would want to hear about the arrival of your little one! This of course includes mostly family and close friends, Co Workers though you might also choose to send them out to old acquaintances, close friends of your parents…anyone who you think would be interested in your child’s birth. Don’t worry that you might send out too many. Unlike shower invites, recipients of the announcement won’t feel at all pressured to send a gift (though you might receive a few “congrats” cards in the mail). Announcements are simply pretty cards that let folks know baby has finally made an appearance. If you're really wondering who you have to send announcements to, it's a different story. Sending cards to your immediate family and closest circle of friends should keep you in the clear. If you aren’t mailing formal announcements to many people, consider covering the rest with an email announcement. They’ll appreciate hearing the good news.